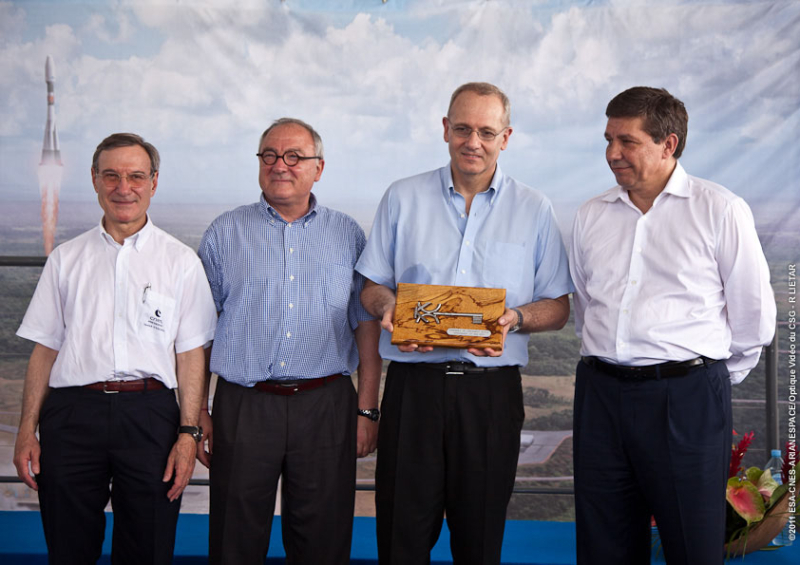 The Soyuz launch pad at the Guiana Space Centre was officially handed over by ESA to Arianespace on 7 May 2011 during a special ceremony at Europe’s spaceport in French Guiana. 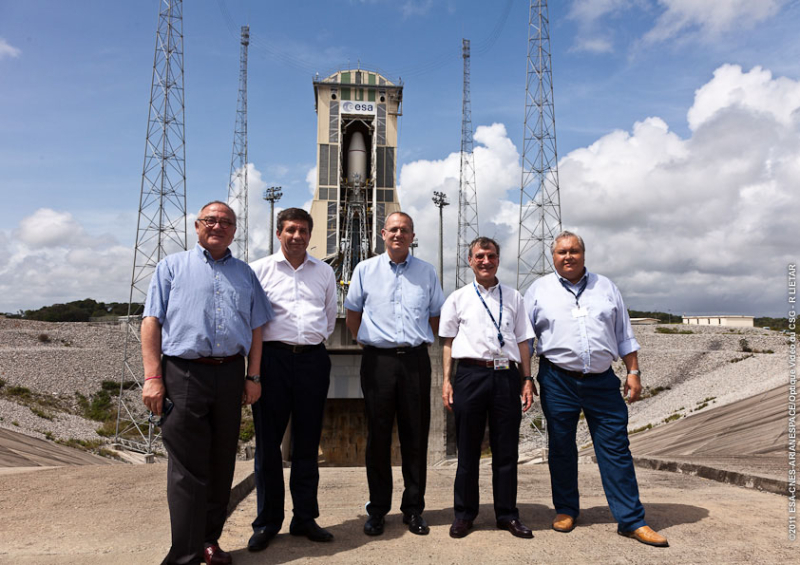 From left: CNES President Y. d'Escatha, ESA Director General J.J. Dordain, Arianespace CEO J.Y Le Gall and V. Popovkin, Head of Roscosmos. Credits: ESA/CNES/Arianespace/Optique Vidéo du CSG – R Lietar. These words from CNES President Yannick d’Escatha aptly sum up the successful completion of the huge Soyuz in Guiana project. 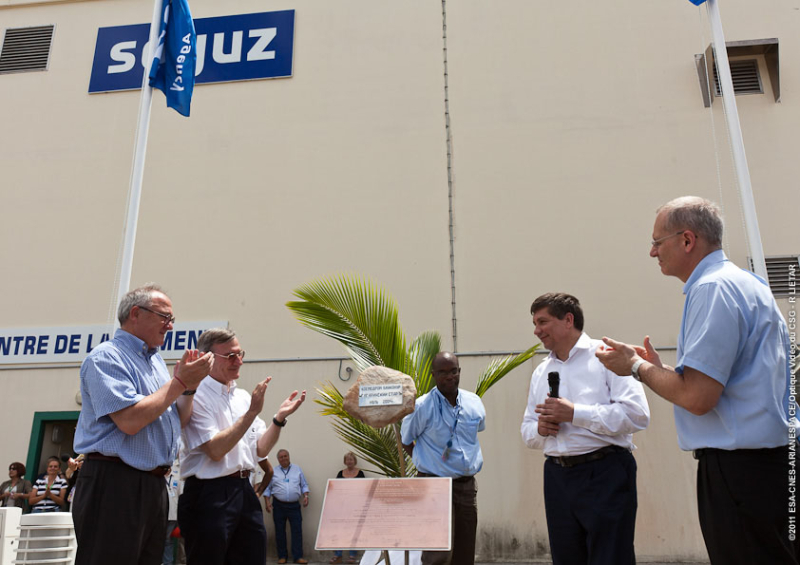 After the final week of successful operational qualification testing, the Director General of the European Space Agency (ESA), Jean-Jacques Dordain, officially handed over the Soyuz launch complex (ELS*) to Arianespace CEO Jean-Yves Le Gall on Saturday 7 May. Inauguration of the Gagarin Stone. Credits: ESA/CNES/Arianespace/Optique Vidéo du CSG – R Lietar. At the ceremony attended by dignitaries from the European, French and Russian space agencies and from Arianespace at Europe’s spaceport, a stone was officially laid on the site as a tribute to Russian cosmonaut Yuri Gagarin. For the past 4 years, Russia and Europe’s finest contractors have been working at the Sinnamary site, near Kourou, to complete the Soyuz at CSG programme for ESA and its partners. Built by CNES and modelled on the launch pad in Baikonur, the ELS complex also comprises a special mobile gantry developed by Russia to erect Soyuz launchers on the pad. The ELS is the result of close synergies between France and Russia that could lead in the years ahead to the launch of human spaceflights from French Guiana. The Russian and European representatives in front of the Soyuz launch pad. Credits: ESA/CNES/Arianespace/Optique Vidéo du CSG – R Lietar.